PPS (Poltinger Precision Systems GmbH) delivers Guidance System for TBM designed specifically for angled shafts. Construction of the tunnel will be achieved using a Tunnel Boring Machine operating at a constant inclination of 24 %, rising from 800 metres above sea level to approximately 1700 metres. 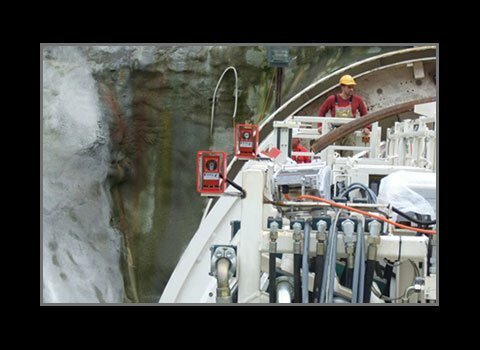 This will demand an unprecedented level of precision since previous mechanical bores for angled-shaft tunnels have only been up to a diameter of 6 meters. The PPS TBM Guidance System for the Aker Wirth TBM – with a diameter of 8 metres and a 4000 HP powered drill head – have been assembled at the construction site in Tierfehd in the Swiss canton of Glarus. In expanding the existing production facility at the Linth-Limmern Power Station AG, the addition of new hydroelectric pumped storage capacity is a significant project for future power supply in Switzerland. The output of the Linth-Limmern power station, located in the southern part of the Swiss canton of Glarus, will increase from 450 megawatts to approximately 1450 megawatts, as a result of considerable expansion of the existing facility with new turbines through the additional new pumping station. Two of the three existing hydroelectric power stations belonging to the network operate underground as so-called cavern power stations. The new power station will also be constructed underground, and will be connected by two reservoirs. Around 600 metres inside the mountain, a new powerhouse cavern is being created at 1700 metres above sea level, housing four turbines and a pumping station, supplied with water from lake Mutt at an elevation of 2400 metres via two parallel pressurised shafts. The water then flows from the powerhouse station through two underwater pipes into lake Limmern, located just below lake Mutt.